Permissions: This work is licensed under a Creative Commons Attribution 4.0 International License. Please contact mpub-help@umich.edu to use this work in a way not covered by the license. A/B testing is a research methodology for evaluating an isolatable design element of a product or service. At its core, A/B testing (also referred to as split testing or multivariate testing) involves presenting users with versions of an interface differing in only one respect (the independent variable) and collecting data on performance metrics (dependent variables) to determine which version outperforms the others. A/B testing has become a staple in the UX community as companies perpetually test and make changes to their online presence. It is a powerful, data-driven technique to improve how users interact with systems. In the context of libraries, however, its adoption has been complicated by scale. Generally speaking, libraries have not been able to successfully “split” a service and gather data from the entire user population. A recent and notable exception is Young (2014), who describes how Montana State University leveraged Google Experiments to test which word best approximated students’ mental model for getting information on research services. Focusing on library websites in particular, there are some barriers to conducting such a large-scale split test. Many libraries do not have direct access to a production server or lack the wherewithal to set up a test in the appropriate software. In addition, A/B testing could interfere with librarians who teach or create e-learning resources based on the current version of the website. Obradovich, Canuel, & Duffy (2015) found that over 70 percent of Canadian Association of Research Libraries and Association of Research Libraries member institutions that provide instructional videos on their library website feature content on using a library catalog, discovery tool, or specific databases. As many of these videos likely use the library homepage as a starting point, it could confuse viewers to encounter a version of the website different from the one seen in the video. What many libraries have done is adopt the basic principle of A/B testing but conduct it on a much smaller scale, typically with a tiny subset of users. Instead of collecting in-the-wild data, they sit the user down and observe a common task the user might perform on the website. And instead of comparing against live variations of the website, they rely on a surrogate or prototype website for variations from the live control. This kind of A/B testing is known as prototype A/B testing and is common in web development projects outside of libraries (Frome & Cohn, 2015). 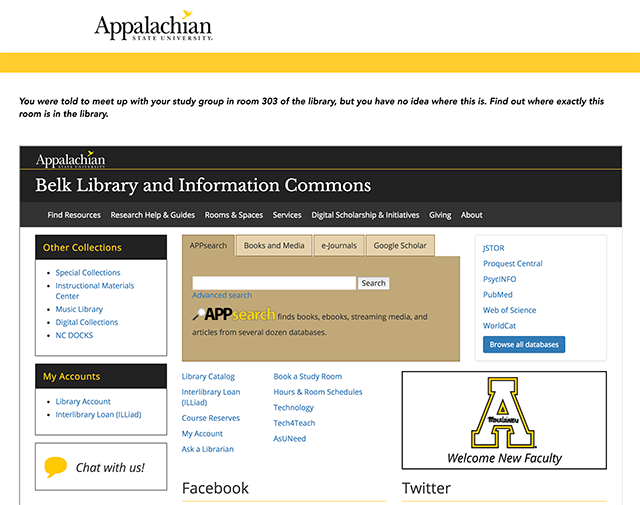 Appalachian State University Libraries recently performed a prototype A/B test of the library website that scaled to a level more typical of a live A/B test, giving us data from more than a hundred users. The technique we used offers libraries the potential for performing larger scale A/B testing while avoiding many of the problems noted above. We accomplished this by inserting the prototype A/B test inside an electronic survey sent out to a large number of students. The survey consisted of tasks to be carried out on a static prototype website embedded as an inline frame, or iframe. Our setup allowed us to track two kinds of data: qualitative, self-reported data in the form of survey questions similar to what is collected in face-to-face usability tests, and quantitative data associated with live A/B tests, such as what pages were visited and for how long. Best of all, the two kinds of data were not disparate but we were able to be joined together, allowing us to see how reliable each measure was when compared with the other. This method relies on standard survey software and a class of software known as static site generators, and it requires only a sandbox server. As no changes need to be made to a live site, libraries may find this a more feasible approach to A/B testing. This paper will walk through the process of what issue we tested, how the test was set up, and how data was extracted and analyzed to inform our decision. A/B testing has been a staple in product development for the past fifty years. Large tech companies such as Google and Facebook continuously experiment with website and app features to gather data on what their user base prefers. As Young’s (2014) article points out, the literature on A/B testing is extensive in fields such as computer science and marketing but essentially nonexistent in library science. However, librarians are clearly thinking about the same kinds of user-centered design considerations, especially given the large emphasis placed on website usability studies. Prototyping, like A/B testing, is an integral part of the design process. It can be used in different stages of the process but is often used early to test features without having to create a functional final product. Prototypes can range from low-fidelity paper mockups to high-fidelity themed websites. Some prototypes have little to no functionality and are used very early in the brainstorming phase, while others have enough functionality to test relevant aspects of the user interaction, albeit with some imagination required on the part of the test participant. For example, one can make interactive paper prototypes by having a human “computer” process a user’s tap; when an element is tapped, the sheets of paper are rearranged, thereby representing the response of the system. Facilitators occasionally need to explain to users that some expected responses could be nonfunctional and ask them to make believe (Pernice, 2016). The literature on using website prototypes in the library setting is somewhat sparse, but representative studies have many commonalities, including recruiting a small number of participants and comparing task performance between a prototype website and a current website. Ellis and Callahan (2012) discuss prototyping in the context of reimagining how online finding aids are organized. They tested users with a Bootstrap-based prototype to see how they would interact with an “atomized”-components approach to viewing archival content. Other examples are more straightforwardly A/B testing using prototypes. 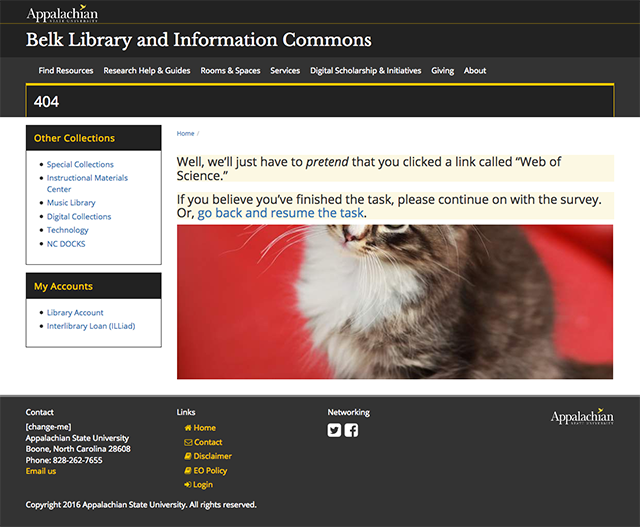 Swanson, Hayes, Kolan, Hand, and Miller (2017), Dougan and Fulton (2009), and Reynolds (2008) used prototype websites in the course of usability testing their library websites. Metrics ranging from the total time on task, task completion, the path of webpages taken, “think aloud” comments, and self-reported ratings all showed that the prototype outperformed the current website. Surveys are frequently used as a research methodology within libraries and are almost certainly the most common data collection method in the field (Halpern, Eaker, Jackson, & Bouquin, 2015). They are helpful for gathering data about the experience, opinions, and attitudes of library users, staff, and other stakeholders. Survey research is typically contrasted with experimental research, although it is possible to manipulate variables in so-called survey experiments. Surveys implemented in library contexts usually adopt a purely descriptive form, but other creative uses have been tried with some success. For example, Symonds (2011) describes how survey software can also be used as a remote asynchronous usability testing tool. Symonds and her colleagues used SurveyMonkey to disseminate both a link to a website and a series of tasks on that website that respondents were to complete. After completing each task, they were instructed to answer questions that could be used to assess how usable the website was. The methodology described in this article builds off Symonds (2011) by combining a descriptive electronic survey with an interaction with a randomly assigned prototype website. We arrived at this approach mostly as a natural extension of our experience with the two featured software tools, electronic surveys and static site generators. In particular, we knew our preferred survey tool, Qualtrics, was capable of displaying and capturing much more information than we had had the need for in previous surveys. Around this same time, we were using static prototypes to mock up ideas during our website redesign process. Merging the two methods struck us not only as an interesting technology challenge but an opportunity to glean the benefits of having rich qualitative survey data with quantitative server log data. The latter would allow us to determine which pages respondents visited and how much time was spent on each page. By itself, this information is informative, but combined with user feedback, it provides us with some insight as to why users did what they did. 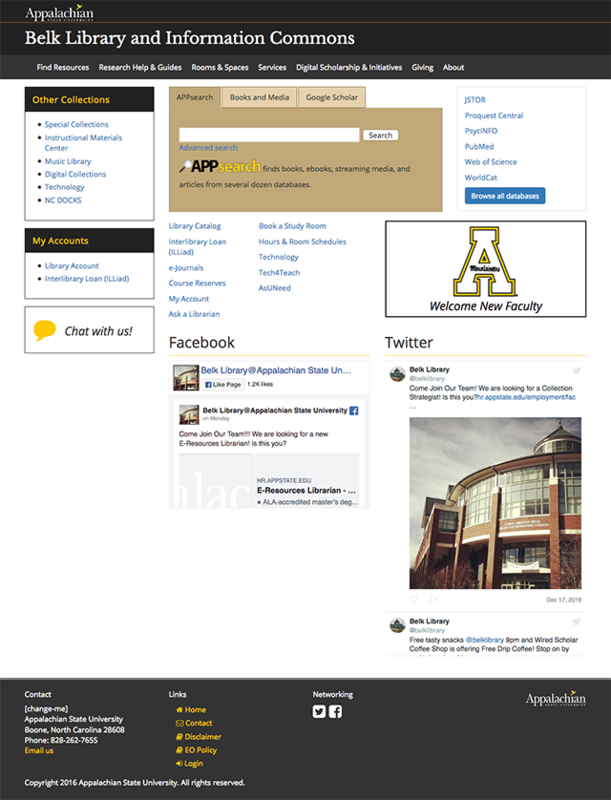 The A/B testing discussed in this article occurred after Appalachian State University’s main library website was redesigned and migrated to a new Drupal theme in August 2017. Leading up to the launch, members of the library’s Web Content Committee had conducted an electronic survey, which included an open and closed card sort implemented with the “Pick, Group, and Rank” question type in Qualtrics. Card sort data indicated there was a need to better organize our content relating to our spaces. Previously, information on the website relating to our rooms and spaces was situated in the “Services” menu item. However, from our card sort we realized that this type of content would be better categorized in a standalone section of the website. In addition, the library had been undergoing a major space renovation. More space for students was being created, the Writing Center was relocating to another floor, and other spaces such as our makerspace and video recording room were being created or expanded. A “Rooms & Spaces” menu item was seen as an important design decision to better inform our users of the changes taking place in the building. When the website was launched, we had put our building floor maps as the “landing page” to this new section as it seemed, at first glance, to be the conceptually obvious choice. Our previous card sorting tests, however, had not specifically looked at where users expect to find a map of the building. The floor maps had been in the “About” section of our website prior to the migration, and a scan of other library websites indicated that this was a common location. We realized we lacked a data-driven rationale for our decision and began looking into ways to test this with our users. Since we were interested in testing two specific and definable options – i.e., floor maps under “About” versus floor maps under “Rooms & Spaces” – we opted to conduct an A/B test. The Web Services department provided us with a single HTML file that contained links to all the required assets on a central server. This HTML file served as the basis of our Sculpin theme. We inserted snippets of Twig code, which is the templating language Sculpin uses, to tell Sculpin where to put our page title and page content. Then we manually created all the site’s pages. Fortunately, for most pages, this was simply a matter of copying and pasting the source code from our live Drupal site and making some minor adjustments, such as removing Drupal-specific HTML code. We created two versions of our prototype website. One situated our floor maps page under “About,” where it had been prior to our migration, and the other located it under “Rooms & Spaces,” where the page currently existed. The sites were deployed to one of the library’s sandbox servers. Since the websites were entirely static, it was not necessary to install or configure any specialized software to get the sites to run. However, there were two specific requirements for the server setup. First, server logging (in Common Log Format) needed to be enabled to capture the respondent’s browsing activity. Second, SSL needed to be enabled in order for the website to be embedded as an iframe in the Qualtrics survey software. Qualtrics was the mechanism through which we recruited participants, but it also enabled us to link together the survey data with data from the browsing session. While we could have used IP addresses or a service like Google Analytics to achieve the same thing, we wanted to keep the survey truly anonymous. This was important to us because if respondents could be identified, we would be obligated to provide information on how their session was being tracked, which might have affected the response rate or the informality we were trying to convey as they approached the tasks. The nature of our project was such that it was limited in scope to gathering data about Appalachian State University users. As that data could not generalize to other populations, it was not subject to human subjects review. However, those wishing to utilize a technique like the one described would be wise to consult with their Institutional Review Board chair or administrator. For details on how we associated a respondent’s survey with his or her browsing activity, see the Appendix. The static websites generated were high-fidelity functional prototypes. See the prototype homepage in figure 1. However, there were a number of features that one would expect on a dynamic library website that could not be replicated on the prototypes, and so we were forced to compromise. First, in areas where the content was too complex to be worth rendering in Sculpin, we left it out or replaced it with a shaded box. This informed the user what should have been there but was not fleshed out in detail. For example, we did not list detailed information on every one of our databases. Since none of these features were crucial for the tasks users were to complete, this was seen as an acceptable compromise, although even here we cannot rule out the possibility that this biased some user interactions. Second, we wanted to track just about everything a user did or encountered on the site in our server log. On a real library website, however, with links and forms directing users to databases, catalogs, and other third-party sites, it is unlikely that the totality of interactions would be captured in a single place. Furthermore, as we were only testing our website, we did not want to allow our users to leave, even accidentally. Our solution was to “lock down” external sites. For each outbound link or form submission, we redirected users to a single page (called “404”) as shown in figure 2. The page captured what link was clicked or what query was submitted, and displayed this to the user along with an explanation for the atypical behavior and access to a “Back” link. This is no doubt a stark case of asking the user to make believe for the purpose of a test, but we felt this was probably the smoothest way to handle this limitation. To confirm this, we did some in-person pretesting of the prototype website with students we found in the library. We simply asked them to complete some tasks that we knew would lead them to this explanation page. Based on observations and talking with them afterwards, we believed the page was sufficiently clear and not unacceptably disruptive. Figure 2. Workaround for outbound links. Figure 3. Prototype website loaded in iframe beneath task description. We collected a total of four pieces of data. In addition to the Single Ease Question, we collected the total elapsed time on task measured in seconds, the “path length,” or total number of page loads needed to complete the task, and the final page that was loaded, which could be used to determine whether the respondent successfully completed the task. All this data came from analysis of the server logs using the R programming language; see the Appendix for sample code. The survey was launched on November 1, 2017. To generate our contacts list, we used a previously downloaded full population list of students currently enrolled at the university. (If a directory list of students is not easily accessible at your institution, consider talking with your office of institutional research as they may be able to provide a full or partial list of student email addresses.) We randomly sampled 4,500 students using the R programming language and sent them invitations to participate. A reminder email was sent to non-responders two weeks later, and the survey was closed on November 30, 2017. No incentives were used. Before doing any analysis, the data first needed to be “cleaned.” Three types of respondents were excluded from the analysis. First, we excluded any respondent who did not finish the survey, which is simply anyone who did not click through to the end and submit the survey on the final screen. This removed 130 responses. Second, we excluded respondents who did not engage at all with the prototype, which we defined as anyone who did not navigate beyond the landing page. Given that our task could not reasonably be attempted without leaving the homepage, we felt this decision was justified. This excluded twenty-five responses. Third, we excluded extreme outliers with respect to time on task. Our goal was to have these tasks completed in a single uninterrupted sitting; we wanted to exclude users who became distracted with other things on their computer or device and came back to the task much later, when it was no longer fresh, as this would significantly overestimate the time needed. This excluded one response that took over nine hours to complete the survey. Out of 130 valid respondents, 67 had been randomly assigned by Qualtrics to interact with the prototype featuring floor maps under “About,” while 63 had been assigned to the prototype featuring floor maps under “Rooms & Spaces.” These sample sizes are significantly higher than anything we could have achieved with in-person usability testing, which typically rely on as few as five and as many as twenty users (Beck & Manuel, 2008). Small sample sizes in usability testing are justifiable but only for problem discovery; they are inappropriately underpowered to draw conclusions about which of several interfaces performs best according to some metric (Nielsen, 2006). The data for each condition are summarized in the table below. Only 31 percent of respondents ended the task on the correct page when floor maps were featured under the “About” page. A large number instead navigated to the page on group study rooms, which is a comprehensive source of information about our rooms, except that it lacks a map of their location in the building. Since room numbers are listed on this page, it is at least arguable whether it provides the necessary information to complete the original task, so the 31 percent may be an underestimate. By contrast, 83 percent of respondents correctly navigated to “Rooms & Spaces” in the other prototype website. This was clear evidence that users expected to find information about locations inside the building on this page. Not surprisingly, users perceived the task as easier when they found the information available on this page. The other metrics we collected, time on task and path length, showed significant differences between the two conditions. When floor maps were featured under the “About” page, respondents took longer to complete the task and required browsing through more pages. These two metrics are represented as histograms in figures 4–7. Note that they are right-skewed, meaning most of the data points are at lower values, unlike a bell-shaped normal distribution. To determine if the two groups were statistically different, we used a Mann-Whitney test, which does not assume that the data come from a normal distribution. This test confirmed that the differences between the two conditions were statistically significant across both metrics. Figure 4. 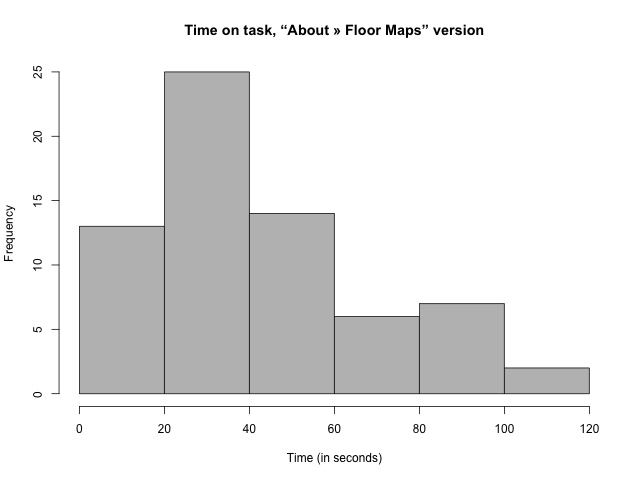 Histogram of time on task, “About » Floor Maps” version. Figure 5. 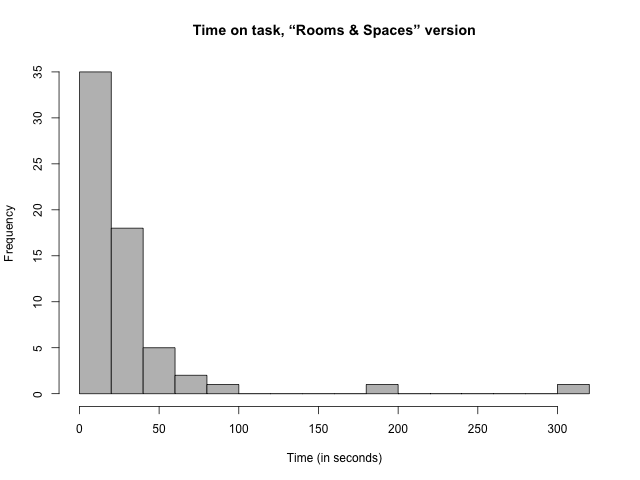 Histogram of time on task, “Rooms & Spaces” version. Figure 6. 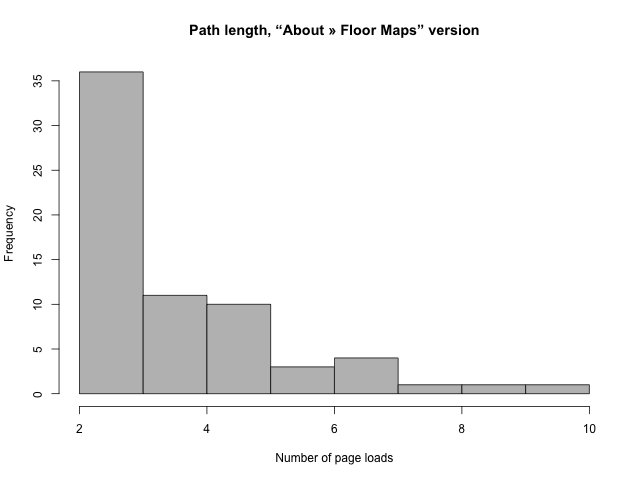 Histogram of path length, “About » Floor Maps” version. Figure 7. 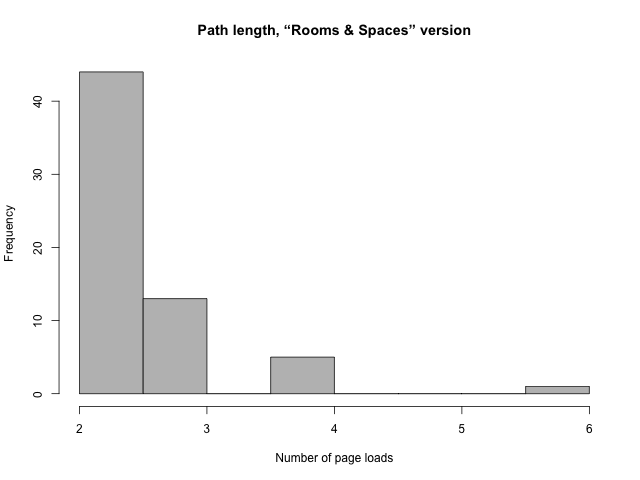 Histogram of path length, “Rooms & Spaces” version. By the same token, A/B testing, like any other research methodology, should not be relied upon in isolation but should be triangulated with other approaches. As an example, the open-ended, free-text responses that we collected as the final survey question, while very helpful, do not come close to capturing the nuanced reactions that are observed in a face-to-face usability test, nor could we probe with follow-up questions to elicit further thoughts and feelings. Others may wish to extend this method by soliciting more data from the respondent, such as class year, major, and degree of familiarity with the library website. That data was not analyzed in our test and may have been relevant. Perhaps heavy users of the library website expected to find floor maps of the building in its “old” spot to a greater degree than light users. It may also be worthwhile to compare the effectiveness of live A/B testing to prototype A/B testing. Beck, S. E., & Manuel, K. (2008). Practical research methods for librarians and information professionals. New York: Neal-Schuman. Reynolds, E. (2008). The secret to patron-centered web design: Cheap, easy, and powerful usability techniques. Computers in Libraries, 28(6), 6–47. document.getElementById("msg").innerHTML = "Well, we’ll just have to <em>pretend</em> that you did a search for “" + getParameterByName("q") + "” in a form named " + getParameterByName("tabClicked") + "." document.getElementById("msg").innerHTML = "Well, we’ll just have to <em>pretend</em> that you clicked a link called “" + getParameterByName("linkClicked") + ".”"
The following R code provides a sample of how to merge data from a Qualtrics CSV with server log data in Common Log Format.